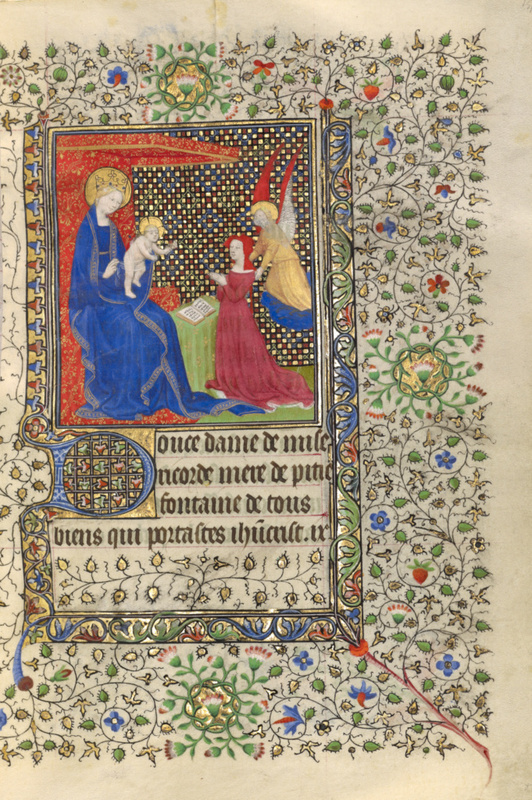 An image of the original owner of the book kneeling in prayer before the enthroned Virgin and Child introduces a French-language prayer to the Virgin in this book of hours. To judge from her dress, the woman--the original owner of this book of hours--was a wealthy townswoman. Her name may have been Margaret, for marguerites (daisies) figure prominently in the border decoration throughout the book, including on this page. As the woman prays at her priedieu, the Christ Child seems to wriggle off his mother's lap in an effort to reach her. This engaging portrayal of the infant makes the scene human and intimate, despite the formality of the angel's presentation of the woman and the Virgin's imposing throne.